Is your computer feeling sluggish? Are you contemplating getting a new one? If so, there is likely a cheaper option to make your computer run like new again. The cheapest option is to simply do a clean installation of the operating system (Windows 7 or Mac OS 10.10). Nine times out of ten, this free (albeit slightly time consuming) chore can make a noticeable difference in how your computer runs. You’ll need to backup your data first to a spare hard drive before starting. What if you have already done that, or are certain that the hardware is just getting too old. 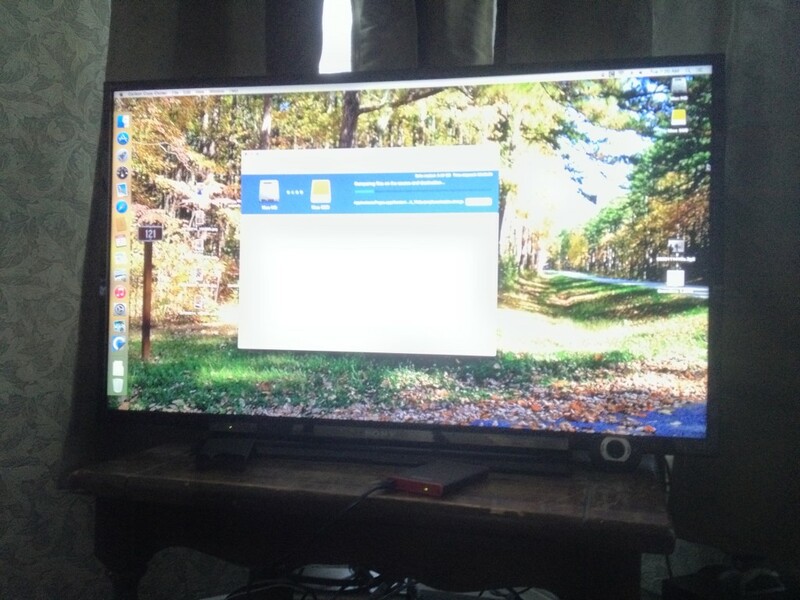 We use an early 2009 Mac Mini as our home theater pc (htpc). It mostly just runs Netflix and Shae uses it for email and web browsing as well. Instead of buying a completely new computer, we just upgraded two components. RAM, or random access memory, has long been one of the most recommended upgrades to breath fresh life into an aging computer. Adding more RAM is like adding more cabinets and counter space in your kitchen. RAM is storage for what your computer is actively working on and by having more RAM available to it the computer doesn’t have to run across town to the store every time it needs something. Most modern computers ship with at least 4 GB (gigabytes) of RAM. Older computers might only have half that amount of RAM. We bought two new RAM modules that add up to a total of 8 GB of ram (about $60). A solid state drive, or SSD, is a relatively new upgrade that will likely make a larger splash in perceived snappiness when upgrading a computer. SSDs store your photos, music, applications, and everything else on your computer. In Windows, it would be the C drive. In Macs it would be the Hard drive on your desktop. Older computers shipped with platter based hard drives, meaning that there was a spinning disk that would rotate at 5400 rpm or 7200 rpm. These hard drives had a lot of storage space for the price and it isn’t uncommon to have a 500 GB or a 1 TB (1 Terabyte = 1000 Gigabytes) of storage. The downside is that they are sloooow and more likely to fail resulting in you losing all of your photos, music, documents, etc. SSDs have come down in price and I was able to pick up a 250 GB SSD for about $90. 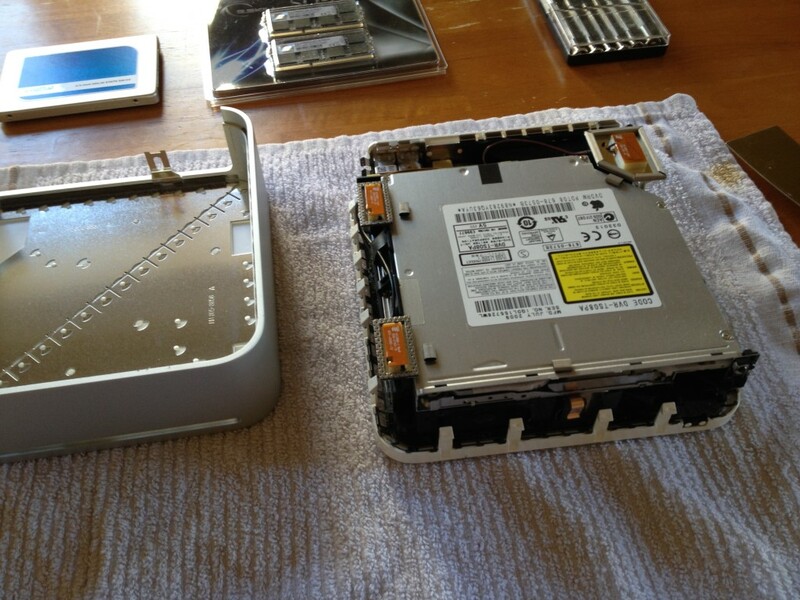 The very first step in upgrading is to backup your current hard drive. 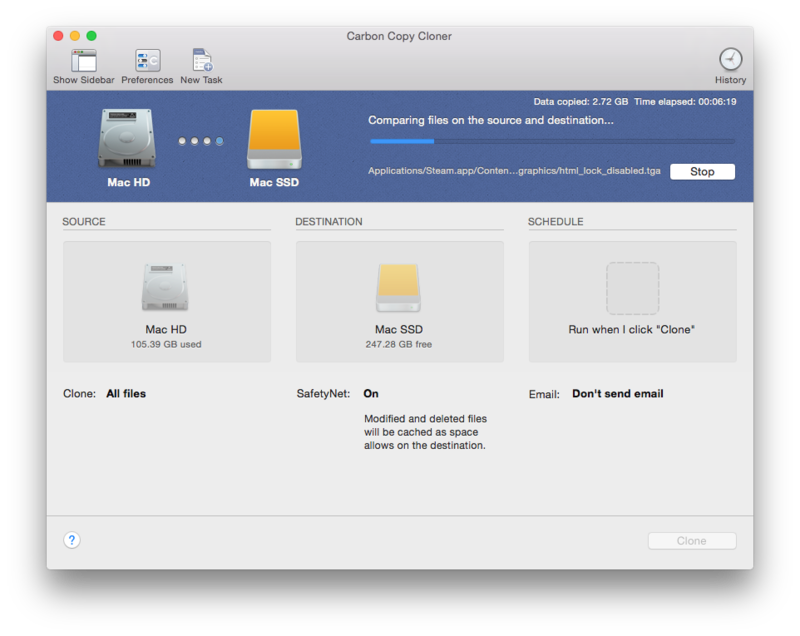 I use a Mac only tool called Carbon Copy Cloner. It creates a complete copy of your hard drive that is bootable. Depending on how much data you have to backup, this step can take several hours. I used a small external USB enclosure to house the new SSD so I could connect it to the Mini. Once you have cloned your old hard drive onto the new replacement SSD you can power down your computer and unplug everything from it. You should use a good clean, static free workspace to do the upgrade. 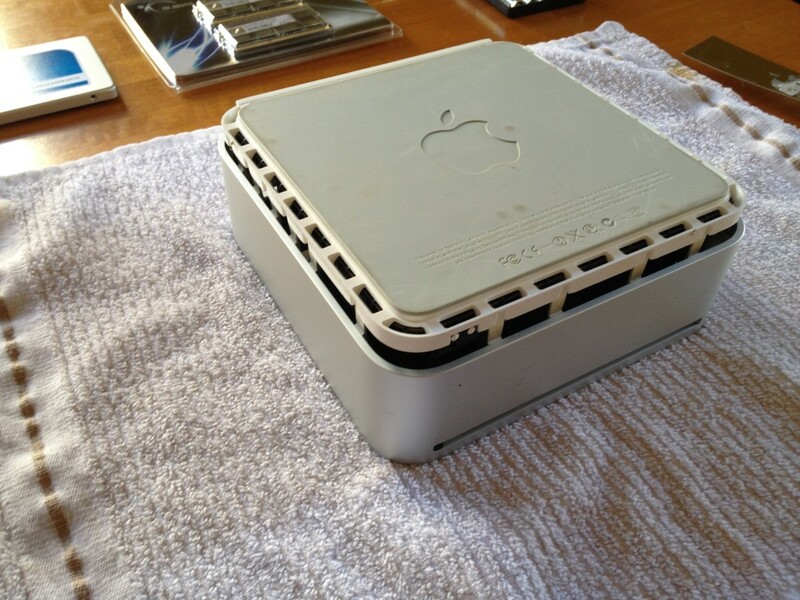 Flipping the mini upside down and using a putty knife opens up the case. Some computers are much easier and some are harder (especially laptops). The case eventually pops off. At this point, I need to unhook the three orange antennas and remove the drive bay assembly (silver thing). With the drive bay unscrewed and unplugged from the motherboard I can remove it and expose the RAM modules. This particular model has two ram slots. I removed each 2GB stick and replaced it with a 4GB stick (4GB -> 8GB). With the RAM replaced, it was time to do the slightly trickier hard drive replacement. 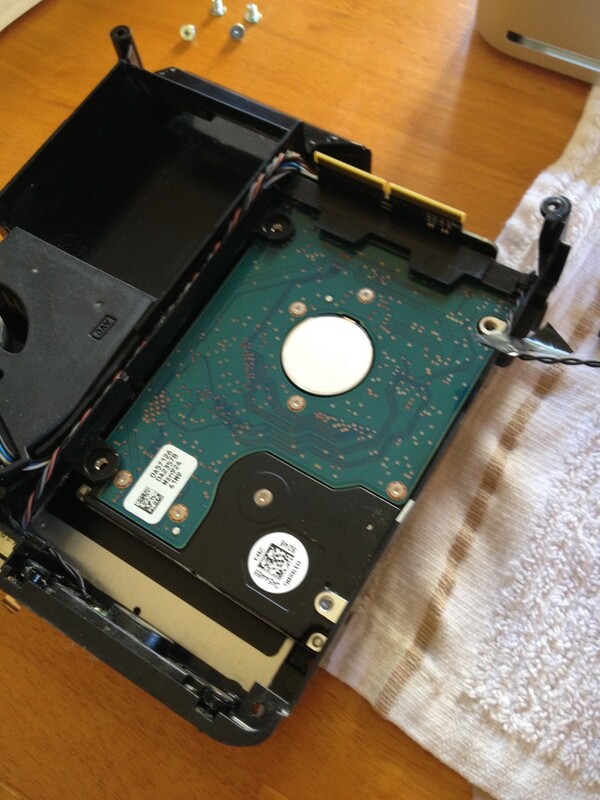 Flipping the drive bay assembly upside down reveals the original 5400 RPM 120 GB hard drive. 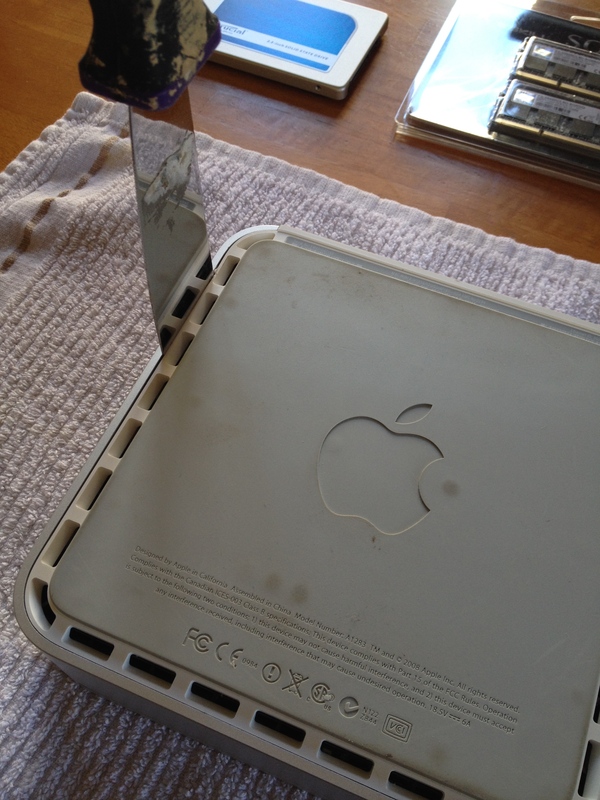 There were four screws to remove, some anti-static bumpers, and a temperature sensor. 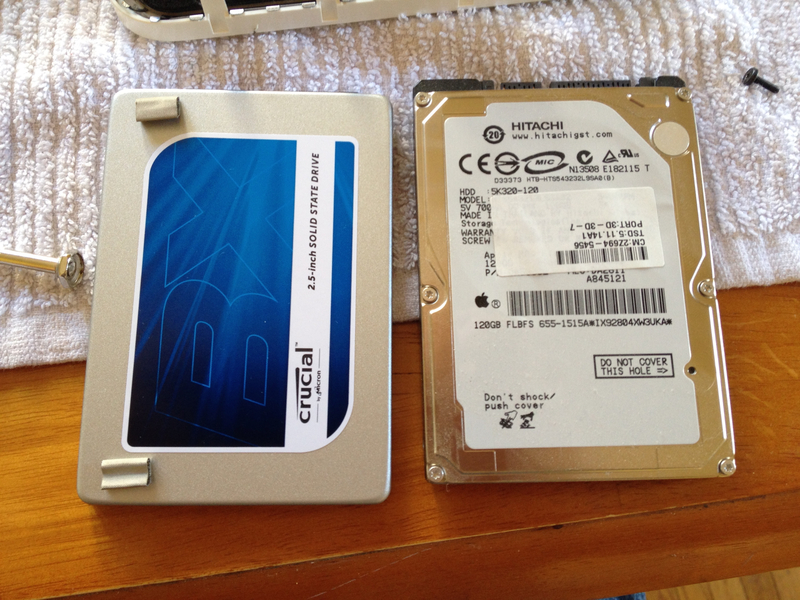 Here are the two hard drives side by side. Older computers, like ours may not be able to fully utilize the speed of new SSD hard drives. 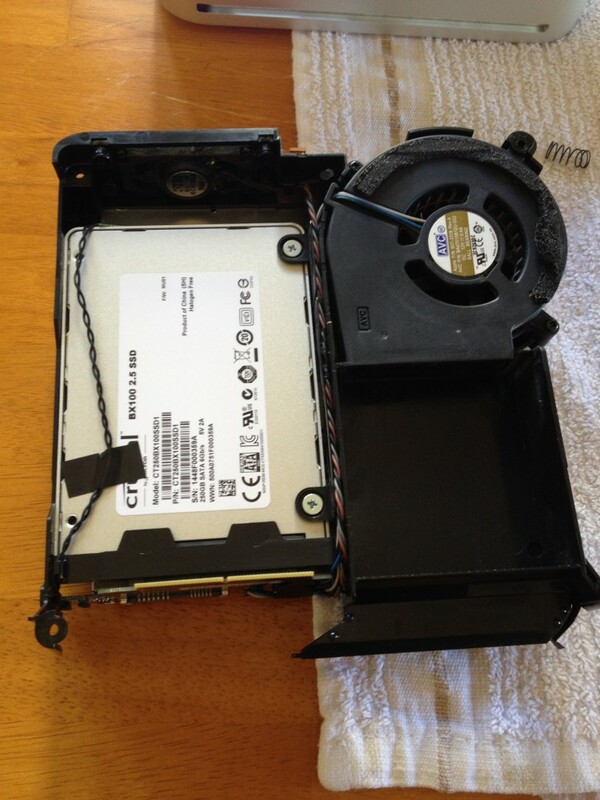 Our Mac Mini uses SATA II technology, but the SSD replacement drive is capable of SATA III. A long discussion about whether or not that matters can be found here. 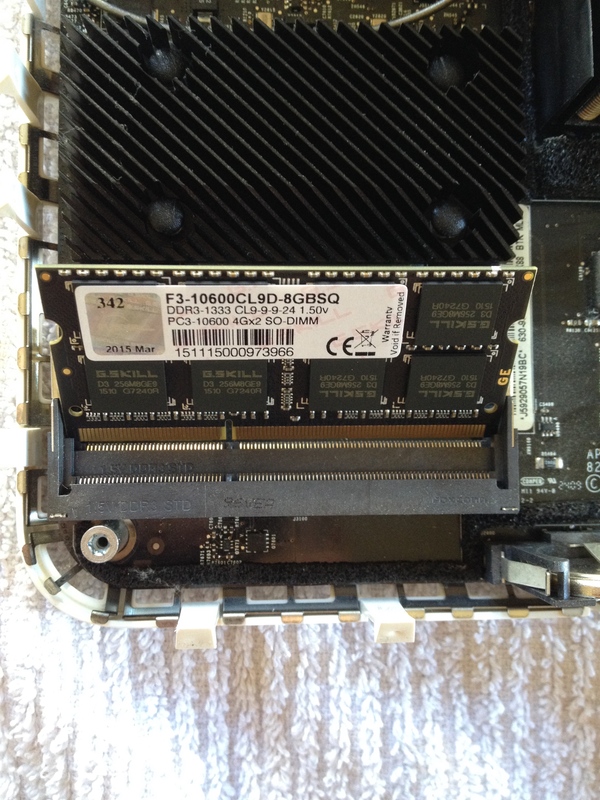 The short answer is that even older computers will still benefit greatly from a SSD upgrade. The rest of the upgrade procedure is mostly in reverse and just a matter of putting everything back together again. 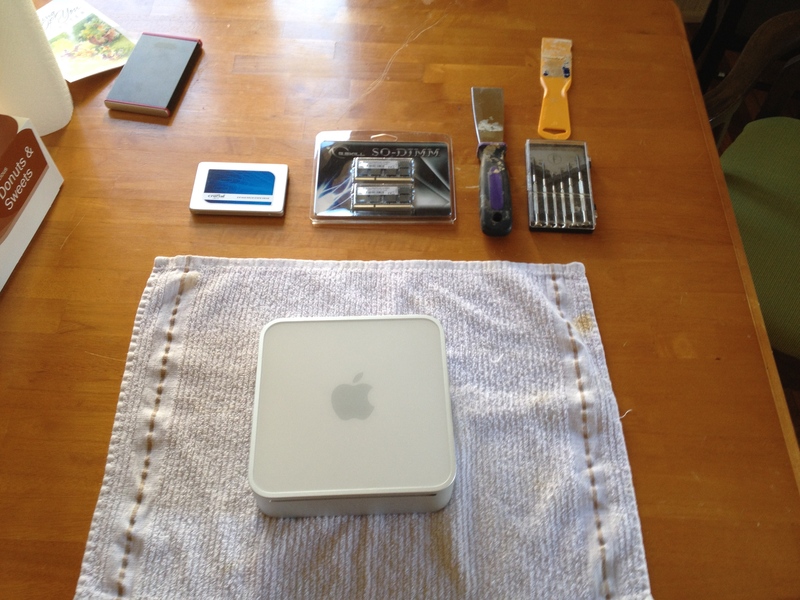 I have worked on this style of Mac Mini before so I knew my way around pretty well. With that said, I still consulted with a few youtube videos just to double check my work. Upgrading your RAM to 4 or 8 GB and replacing your old disk platter hard drive with an SSD are two easy and relatively cheap upgrades that will keep your computer running briskly for several more years. I spent more time writing this blog post than actually doing the work (if you don’t count waiting for the backup to complete). The total cost was about $150 which is significantly less than the cost of a new computer. RAM was doubled from 4GB to 8GB and the hard drive capacity also doubled from 120GB to 250GB. The new SSD is also significantly faster than the old hard drive and that makes the computer boot up faster, apps open quicker, and files copy in a fraction of the time. Some computers (especially laptops) do not have user upgradeable RAM or hard drives. 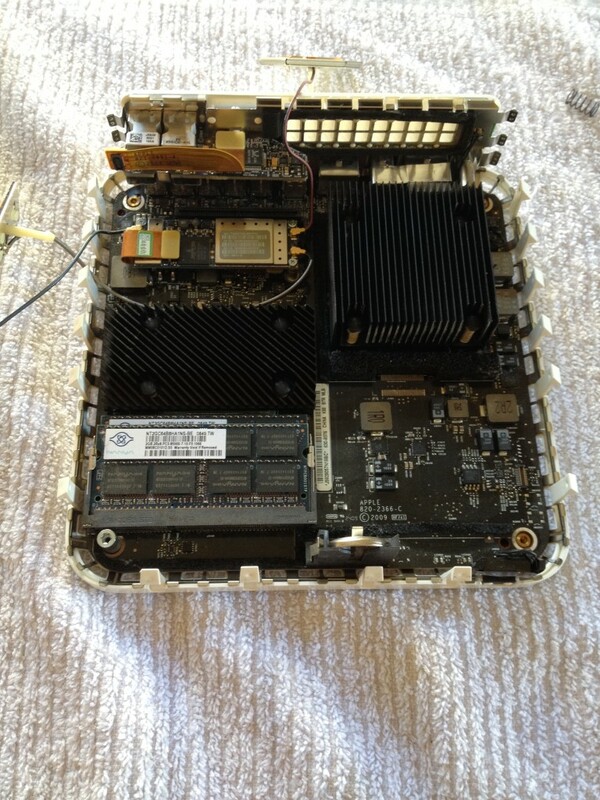 Apple is particularly guilty of soldering in RAM modules so that they are not user replaceable. Do a quick internet search for your make and model to see what is upgradeable and the complexity of those upgrades. I am predicting that desktop and laptop computers will soon be like VCRs of old where it is cheaper to buy a new unit than to repair an old one. Until that day though enjoy tinkering around circuit boards! The weather has been very Spring like lately. Some days it is overcast and cold and other days it is sunny and warm. 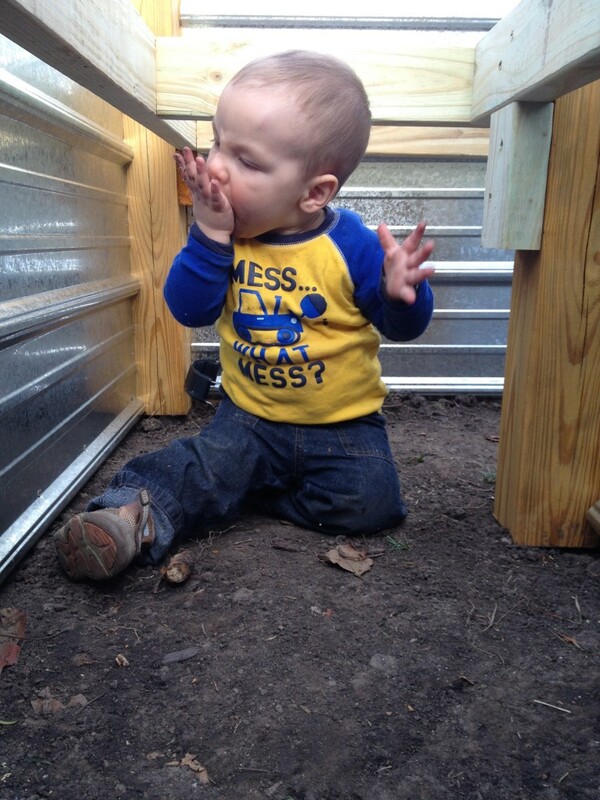 We have been trying to get outside as much as possible to get some fresh air and vitamin D.
I have been keeping busy with a new project, one that I will be showing off on this blog once it is finished. 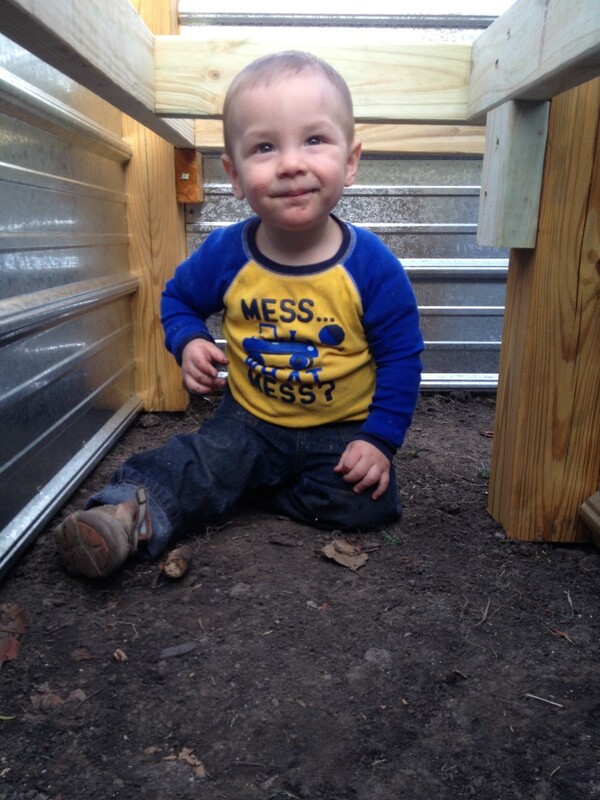 Frugal Boy hangs around and plays in the dirt. Well, technically he eats it. Do you want to save $50-$100 bucks in five minutes? Of course you do! Keep reading to learn how. Did you know that you can shop around and choose what company you buy energy from? That’s right, you don’t have to purchase your electricity or gas from the company that pipes it to your door. Our municipality just negotiated a new two year contract on behalf of residents for electric and after seeing the results of said negotiations I was left with more questions than answers. The new two year fixed opt-out rate is for 5.6¢ per kilowatt hour (kWh) plus an additional 0.1¢ city imposed fee on top of that for managing the aggregation program. That rate is for raw energy, and that energy still has to get from where it is generated to your house, and that is the distribution charge that you pay to your electric company. In our case, we have Ameren. 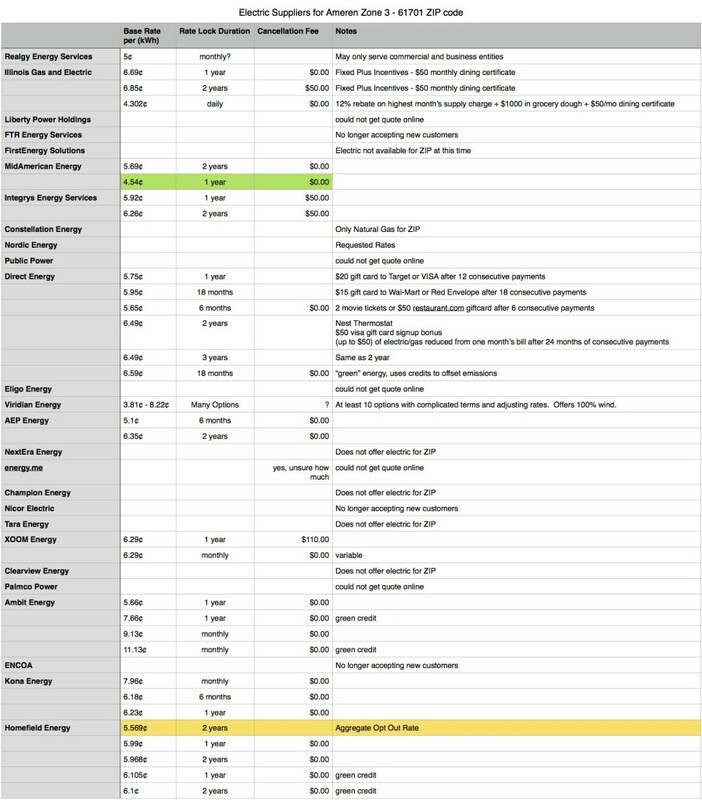 Ameren’s website has a list of suppliers that you can purchase from so I did what any good nerd would do and opened up a blank spreadsheet and got to work. Here is the result of a lunch break’s worth of internet sleuthing (click on it for a PDF version). Most of the suppliers were more costly than the negotiated aggregate rate. I would kind of hope that the collective bargaining power of 30,000+ households could beat an anonymous internet quote. With that said, there were two suppliers that offered better one year fixed rates than the default Homefield Energy. MidAmerican Energy offers a 4.54¢/kWh one year fixed rate with no cancellation fee. Viridian Energy offers a slightly higher 5.49¢/kWh one year fixed rate with a cancellation fee. Both options beat the city negotiated rate. I hear you saying, “Okay Andrew, this isn’t a very good comparison.” These lower rates are one year vs two year, and that is true. In order for it to balance out, rates in the second year would have to increase to 6.7¢/kWh for MidAmerican Energy. A number that is hardly even seen on the price matrix as of today. I would peg the probability of such a rate increase in one year’s time as very small. “Well, what about the environment Mr. Smart Guy? !” Each energy supplier has their own breakdown of how their energy is generated (MidAmerican, Homefield Energy). Coal, one of the worst polluters is also one of the cheapest forms of electric generation. So how do Homefield Energy and MidAmerican Energy compete in terms of ‘greenness’? Taking coal and natural gas together (arguably the two worst polluters) pins Homefield Energy as the dirtier supplier with 72.33% of their electrical generation coming from those two sources. So in this case, it is not a matter of paying more to Homefield because they offer cleaner electrons. 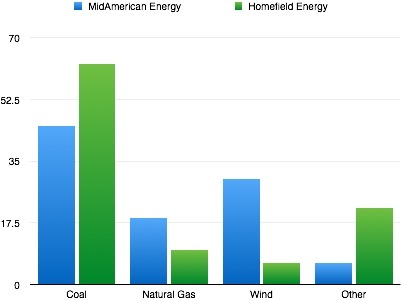 In fact, MidAmerican has about 30% renewable energy (in the form of wind) compared to Homefield’s dismal 6%. So MidAmerican is cheaper and cleaner, but does it really matter to John and Jane Doe consumer? I mean, it is only 1.06¢ difference per kWh. According to U.S. Energy Information Administration, EIA, the average U.S. residential utility customer used 10,908 kWh in 2013. Multiply that usage by the cost difference between these two suppliers (.0106) and you end up with $115.62 in savings per year. Not too shabby for spending 5 minutes on an enrollment website. We personally stand to save about $58 based off our usage (5514 kWh) in 2014. Alternatively, we could spend an extra $50 and go with Viridian’s 100% renewable one year rate at 6.49¢/kWh. At the end of my hour traipse through different electric supplier’s websites I am still left with the question of why our municipality agreed to the contract that they did. There are cheaper options available and there are greener options as well. Heck, for a cash strapped city that is always claiming to look for more revenue, it doesn’t take much creativity to set the opt-out rate at MidAmerican’s low price of 4.54¢/kWh and then add on a surcharge of 1.06¢/kWh to bring it up to their current contract rate. The city would pocket about 3.9 million dollars!! The precedent for adding a surcharge is already there, they currently add one and nobody has raised a fuss. A spokesperson for one energy supplier said that less than 10% of customers opt out of aggregate contracts. Most people simply don’t care. Perhaps MidAmerican couldn’t generate enough electricity for 30,000 households. That still leaves the possibility of using Viridian’s one year fixed rate @ 5.49¢/kWh. Not only is it 50% renewable, quite an improvement over 6%, but if the same money raking strategy was employed here the city would still be able to generate over $400k in revenue. I may be missing a piece of the puzzle, but it seems to me that there is a drastically better solution available than the one that has been presented to the public. The current 0.1¢ surcharge to manage the aggregate program is estimated to generate about $370,000. I spent a lunch break and found a better rate. 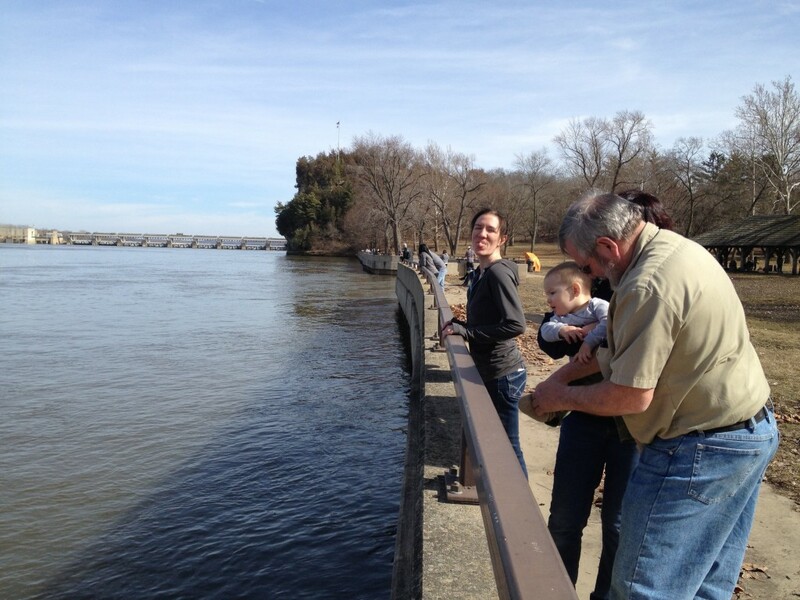 On Sunday we ran some errands around town and then hit the road for our second hiking trip. 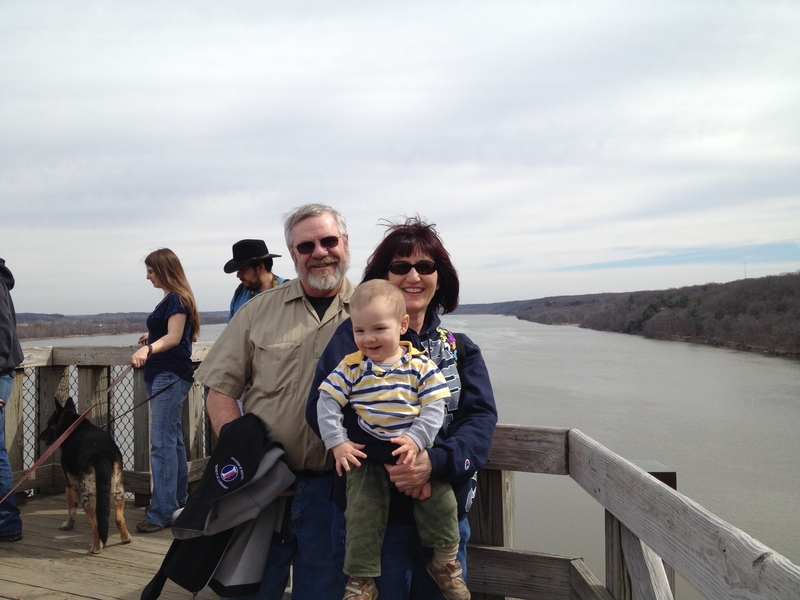 A short drive later and we had arrived at our destination, Starved Rock State Park. 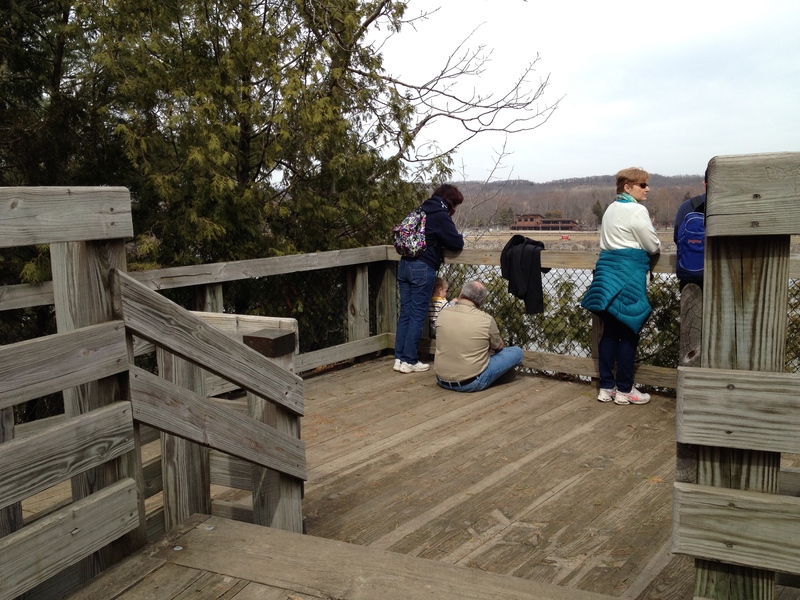 Starved Rock sits on the south side of the Illinois river in the center of the state. 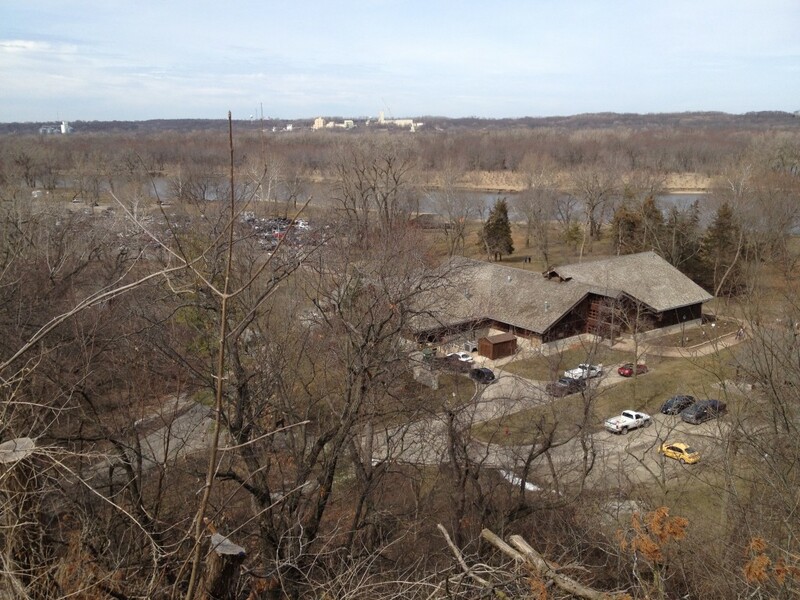 As with all Illinois parks, there is no entrance fee. 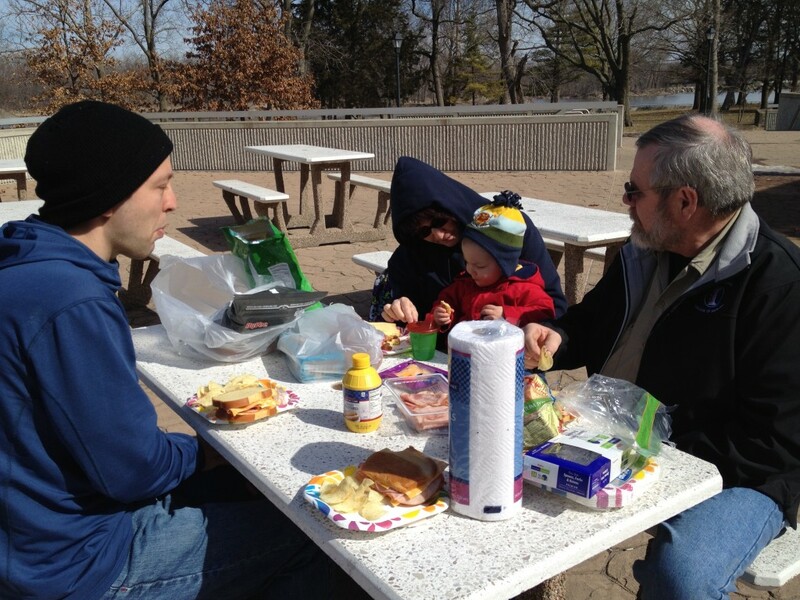 We met up with Grandma and Grandpa just in time to have a picnic lunch. It was a bit chilly outside but the sun sent rays of warmth that had us taking off our jackets later in the day. After lunch and a few trips to the parking lot and back to get the appropriate baby gear for hiking we set off on our first trail. Baby carriers like the Boba are, in my opinion, essential to hiking with a little one. 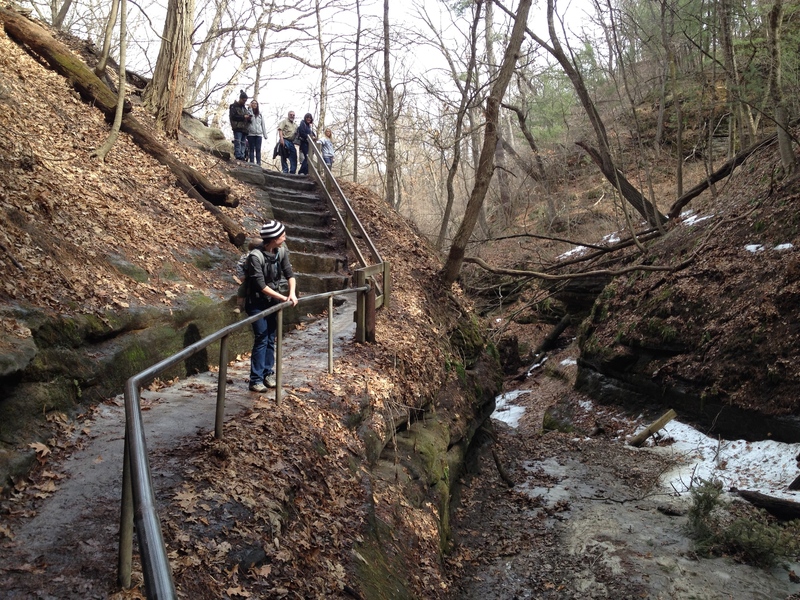 There were many stairs on the trails and it would have been impractical to take a stroller. We tried to let Frugal Boy out frequently so he could get some of his wiggles out. The day before he spent too much time in the carrier and by the time we got home, we were exhausted and he was ready to crawl all over us. 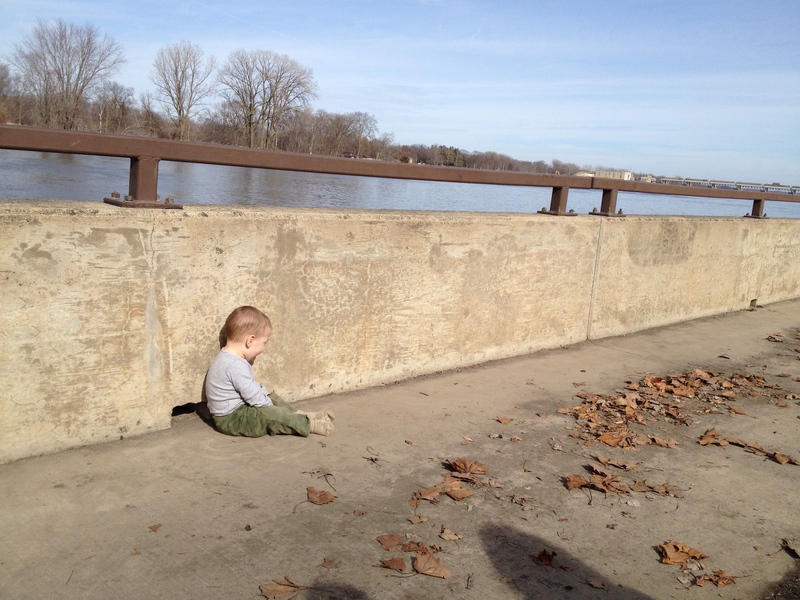 The grandparents were happy to keep an eye on him, while I watched a barge go through the lock. 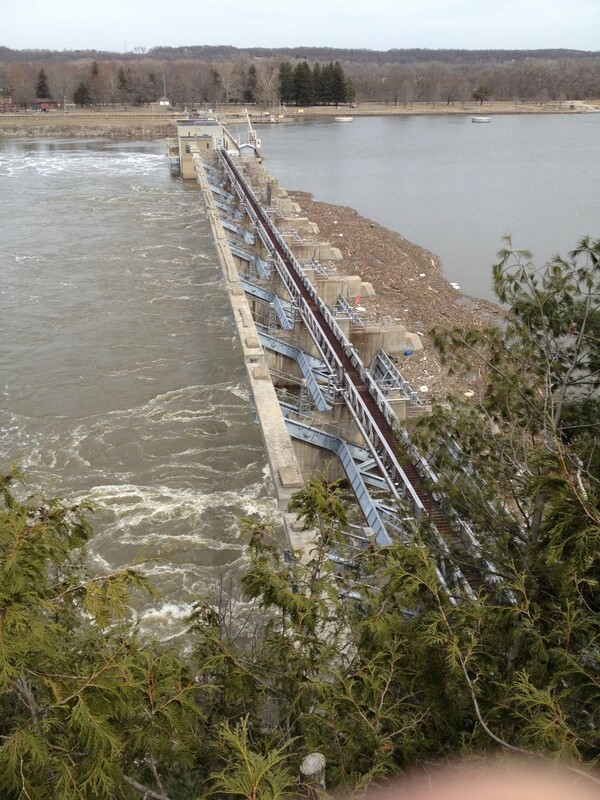 There was plenty of debris caught up by the dam. 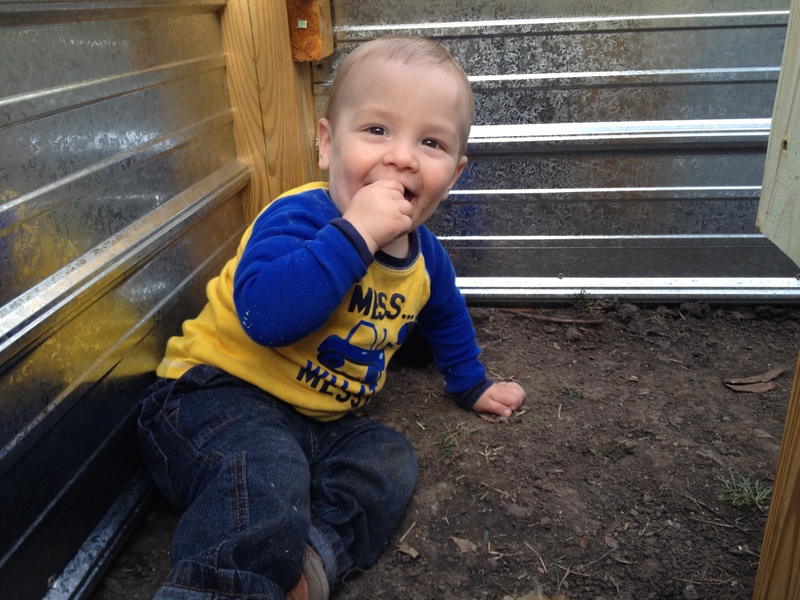 Frugal Boy found that he could sit on part of the fence that was just the right height for him. 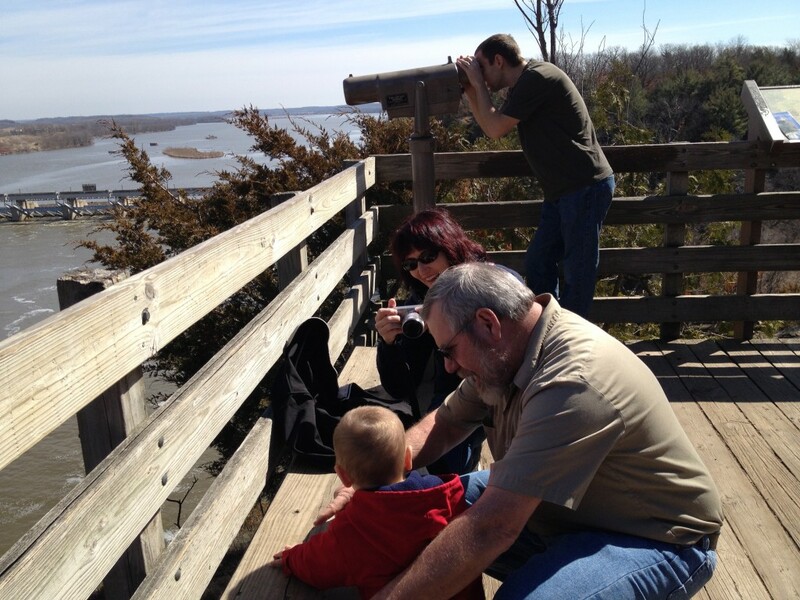 Eagle Cliff Overlook seemed like a good place to turnaround. A few years back, Shae and I hiked about three miles beyond the overlook and the trails were not as interesting. Perhaps the next time we visit we will try some of the side trails and canyons. We worked our way back to the visitors center via a roundabout way so we could see French Canyon. 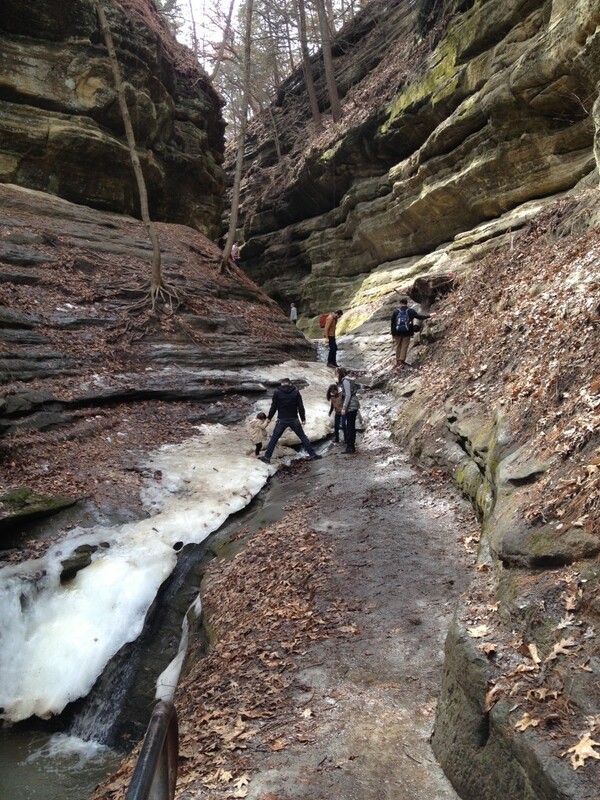 The canyon was very icy and the grandparents wisely chose to watch us from afar. Shae and Frugal Boy turned around when the handrail ended, leaving just me to scratch a bouldering itch. 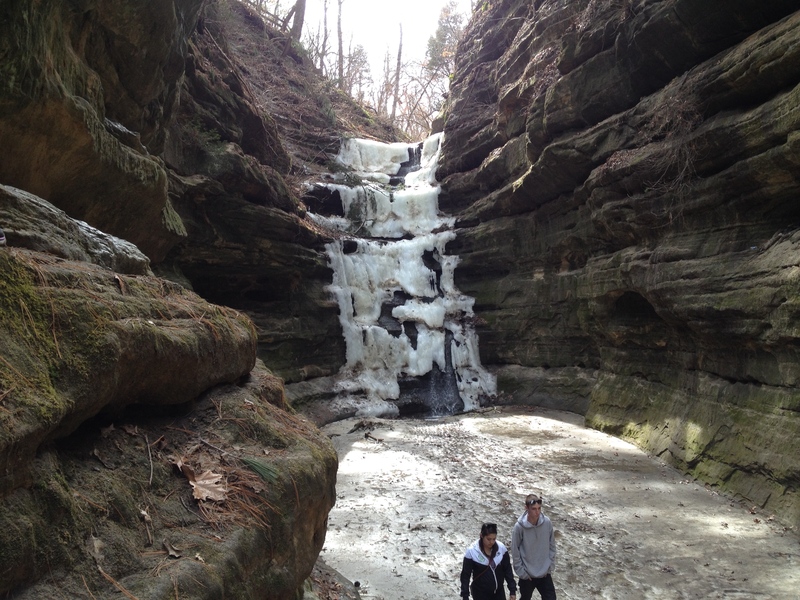 After some precarious footing, I managed to get a glimpse of the icefall. Back at the river front we threw leaves and sticks in. It’s not like it isn’t already imprinted in little boy DNA, right? 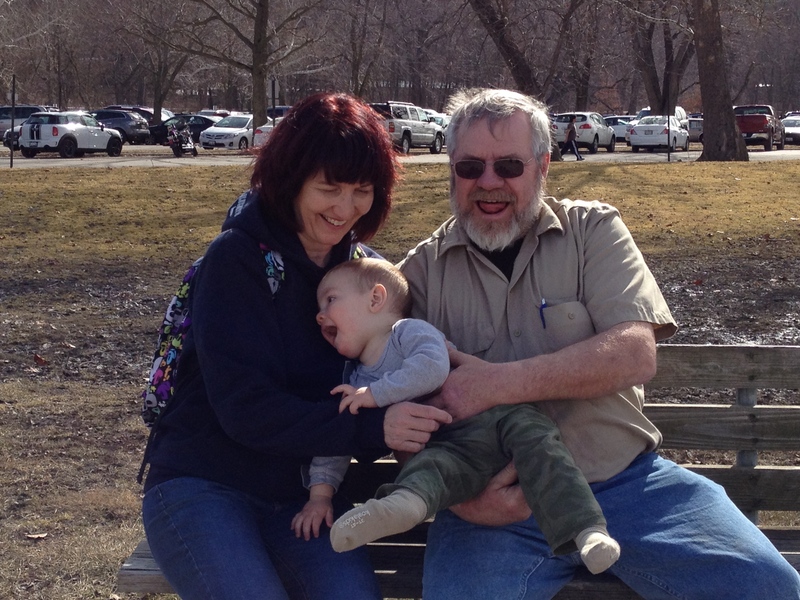 We tried to get a good picture of the grandparents and grandson, but Frugal Boy wasn’t very cooperative. Shae and I thought about putting a little jar or box next to this cute hobo. I wonder how much money he would have raised. 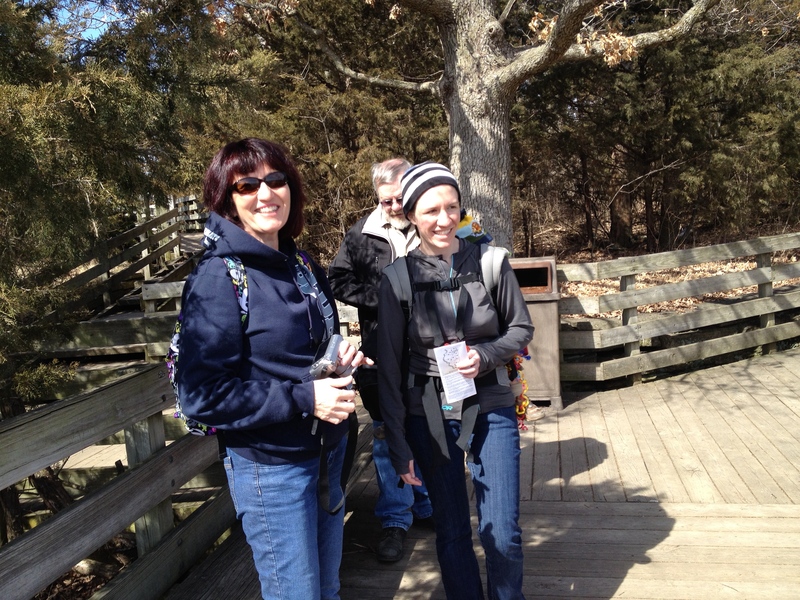 It was a fun day and the unseasonably warm weather has left us. We’ll be doing plenty of hikes this year and I am already starting to get the itch to go out and camp. That will definitely have to wait until it gets warmer though! Yesterday I mailed off our federal and state tax returns. 2014 was a good year for us, both in income and reducing our tax burden. 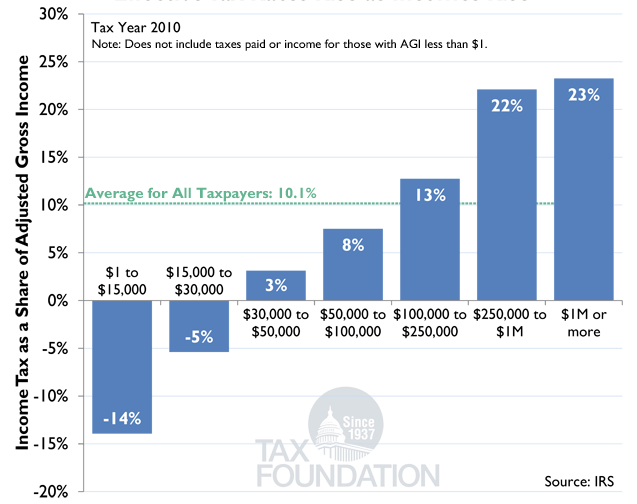 Reducing the amount of taxes that you pay is in my opinion, the best way to increase savings. You don’t have to work any harder (more hours, second job, etc.) and you don’t have to decrease your spending (i.e. being frugal). Our marginal tax bracket was 25%, but by contributing to tax advantaged retirement accounts, like a 401k, we were able to drop down into the 15% marginal tax bracket. Our effective tax rate, what percentage of our income we actually had to pay after all of the deductions and credits was 10.96%. In other words, we had to earn $1.12 in order to spend $1. You can figure your own effective tax rate by dividing your total tax (line 63 of form 1040) by your total income (line 22 of form 1040). All in all, I feel like we are successfully managing our tax burden. Our effective rate dropped about 1% point from 2013, thanks largely in part to Frugal Boy. The extra deductions and credits that come with having a dependent make a sizable difference in your tax bill. Last year’s post about this topic can be found here.